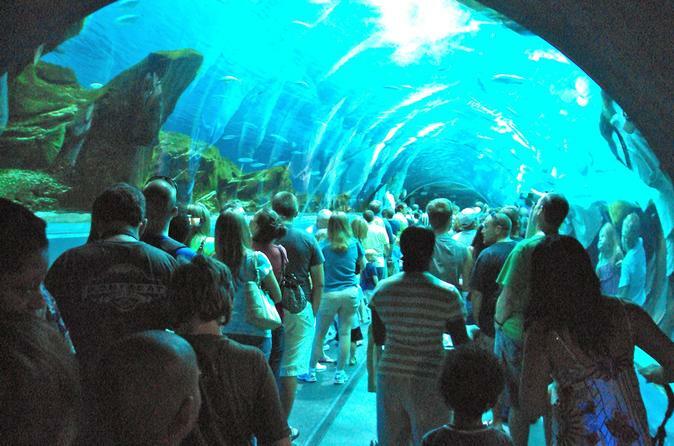 Delve into the fascinating undersea world of the Georgia Aquarium, the largest aquarium in North America with over 100,000 animals in 10 million gallons of water. Encounter whale sharks, dolphins, and beluga whales as you tour the 6 themed aquatic galleries. Feel what its like to be part of sea life. Round-trip transport, entrance fees and snacks are included in tour! At the Georgia Aquarium, your family will wonder at the beautiful marine environment. In this guided half day tour, you'll enjoy roundtrip transportation from your hotel to the Aquarium. Immerse yourself in the cool blue of the Ocean Voyager’s 100 foot-long underwater tunnel. You are totally surrounded by thousands of fascinating sea life, including four whale sharks. It’s one of the largest aquatic exhibits in the world. Experience the incredible 4-D theater that incorporates special effects built into the entire theater including the seats. Programs and activities are engaging, entertaining and educational, with something to appeal to everyone! Encounter whale sharks, dolphins, and beluga whales as you tour the 6 themed aquatic galleries. You may also encounter African Penguins on their daily stroll!